If you are a bird lover and you wish to attract birds into your backyard then one of the things you have to invest in is a birdbath. Remember that all birds require water. 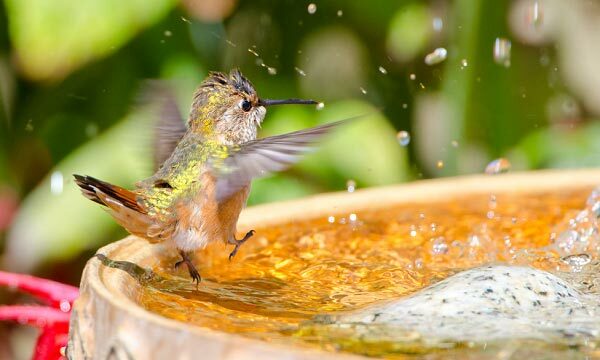 Adding at least one water feature in your backyard can, therefore, help in attracting your feathered friends. Also, take note that birds require water for two major reasons – for drinking and preening. Just make sure that you know exactly where to place a birdbath so there is a hundred percent guarantee that various bird species will approach it. One great thing about water is that it cools both the inner and outer parts of a bird’s body. A water bath is also helpful in removing dust, parasites, loose feathers, and any other debris from their plumage. That said, having a birdbath in your backyard, which is the key to offering water to birds, can help attract them more than any sources of foods. Just ensure that you add moving water because the motion will attract more bird species. This is a classic birdbath, which stands around 3-4 feet over the ground. It features a post-style base integrated into an elevated dish. If you choose this design, take note that your choices include those constructed out of concrete, ceramic, metal, and plastic materials. You will also notice that it is available in various decorative colors and designs. You might also want to pick the heated birdbath design. It is ideal for you if you are living in a place with a colder climate. Note that it a huge amount of energy is required in melting snow for drinking. With that, you can expect birds to be more than willing to visit any available source of water the entire year. If you already have an existing birdbath then you can always add a heater accessory or feature into it. It is also possible to invest in fully heated models and add them to your home or yard. You can also choose to invest in a dish birdbath design. It often comes in a shallow bowl or simple saucer design. You can actually use dishes at various heights by putting them on a patio table, fence, step, stump, or ground. Other great choices are hanging models and dishes that you can easily connect into the deck railings. So Where Should You Place a Birdbath? Once you have chosen a birdbath design, it is necessary to decide on the perfect spot or location for it. Some birders believe that all birdbaths are helpful. While that is true, you can’t expect a wrongly placed birdbath to perform its intended function. In fact, a wrong place or location for the birdbath might actually hurt the birds you are planning to attract. For instance, if you put the birdbath beneath a bush, feeder, or tree, there is a chance for it to get filled with debris and dirt immediately. This might cause the growth and buildup of bacteria and mold that can trigger diseases. 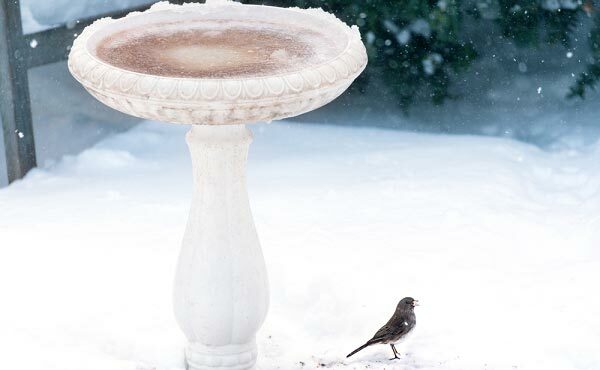 Putting the birdbath in a place near windows might also cause injuries and collisions. Putting the birdbath in a place that provides easy access to predators might also put the birds in danger. Weight and size – The weight and size of the birdbath are two factors that are helpful in determining the right location or placement for your birdbath. That said, it is necessary to use your judgment when it comes to making a decision. One thing to keep in mind is that you will have a hard time moving a heavy and concrete bath. This might also sink to the soil. However, an excessively light and small birdbath might also need a shelter to prevent it from getting knocked over. You have to take these things into consideration when deciding the perfect placement for your birdbath. Climate – Another key factor that should help you determine the right place for the birdbath is the climate. Note that seasonal changes and the local climate have a say on the perfect spot for the bath. For instance, if you live in a Northern area then you might need to look for a sunny spot for it. It is because the sunlight is beneficial in ensuring that the water stays warm during cool days while also ensuring that it stays liquid during the winter. Visibility to birds – You also have to choose a location based on how visible the birdbath is to birds. Note that you can’t expect birds to come near it if they do not see it. This is the main reason why you have to find a spot that is really visible to them. The location should also be visible to you as this allows you to enjoy an incredible viewing pleasure. Stability – When choosing the right location for the birdbath, one more important thing to remember is to put it in a level and safe area. It should be a place where you will not spill, fall, or tip easily. Ensure that it is level to improve its stability while also maximizing its water capacity. If needed, you might also want to use a patio stone or gravel beneath it. Cleanliness – Your chosen spot should also be clean enough. 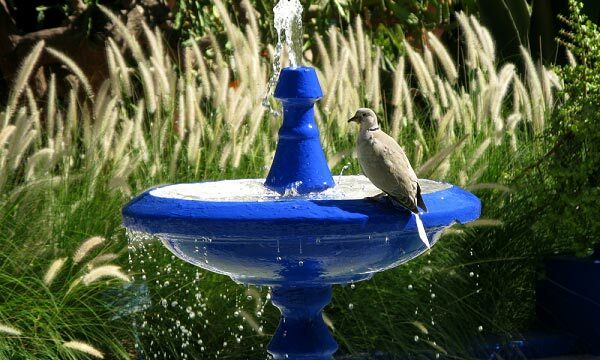 Cleanliness is important to prevent the spread of diseases and to ensure that birds do not acquire any form of illness from coming in contact with your birdbath. One thing that you can do is to prevent yourself from putting the birdbath under shrubs and trees. You also have to put it away a few feet from those who feed birds. Source of water – It would be ideal to put the birdbath in a spot, which is close to a spigot or hose. That way, you can easily maintain its cleanliness and keep it full and fresh. 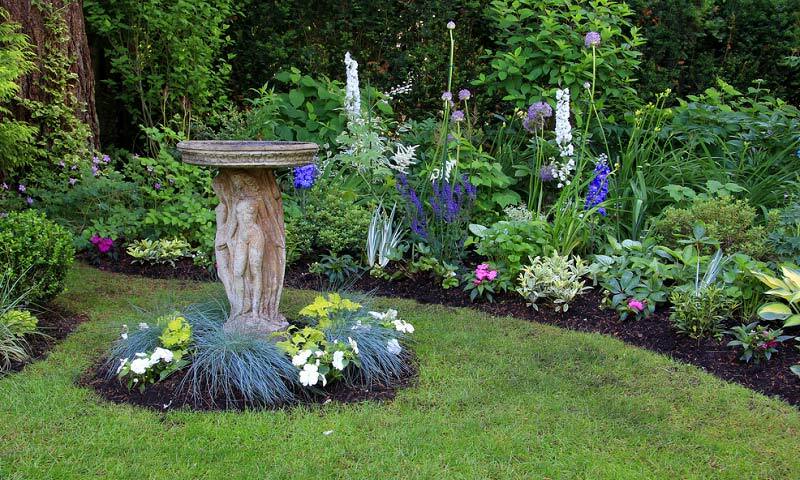 One more tip to keep in mind when you are searching for the perfect place for your birdbath is to put it in a flowerbed or garden with spills and splashes designed to conserve the use of water and ensure that plants are watered properly. It is also advisable to have some sort of shade so you can control the temperature of water. In addition, it should be positioned away from the reach of kids and pets. This is helpful for the safety of birds and in ensuring that they do not get exposed to dangers and safety hazards, like algae, bacteria, feces, and other harmful materials. 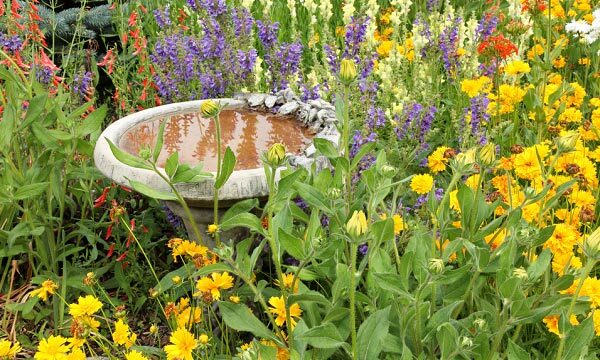 Using several birdbaths in various locations is also helpful in meeting the different drinking and bathing requirements of birds and capturing the attention of more bird species. Aside from that, you also have to remember that birds are nervous species. They tend to get jittery when bathing or drinking. Also, you have to make sure that the birds don’t feel like they are too exposed; otherwise, you will not be able to attract them. That said, look for a place close to a tree or bush and position your birdbath there. This is one of the best answers to where to place a birdbath as this allows the birds to escape with ease each time they feel like there is a threat to their safety.